A giant inflatable room that astronauts may one day use to live on Mars has successfully been deployed at the International Space Station where it is set to undergo a two-year test. The Bigelow Expandable Activity Module, called BEAM for short, is a first-of-its-kind inflatable habitat that was carried to the ISS on the SpaceX Dragon. Astronauts spent four hours installing the giant fabric room on Saturday, attaching it to the station's Tranquility module. "At the end of May, the module will be expanded to nearly five times its compressed size of 7 feet in diameter by 8 feet in length to roughly 10 feet in diameter and 13 feet in length," a NASA blog post explained. Sensors inside BEAM monitor temperature and radiation changes, along with how it fares against potential orbital debris. Over the course of a two-year experiment, astronauts will enter BEAM for several hours at a time to collect data and assess conditions inside the room. 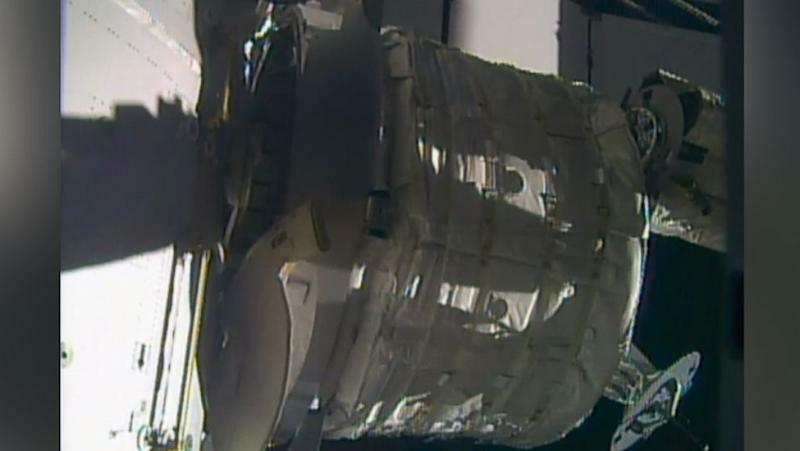 During that time, NASA plans to keep the airlock between BEAM and the space station closed. If punctured, BEAM is designed to slowly compress, ensuring that it does not pose any danger to the space station. "When we’re traveling to Mars or beyond, astronauts need habitats that are both durable and easy to transport and to set up. That’s where expandable technology comes in," NASA said in a blog post. The idea was first conceptualized by NASA in the 1990s and was built by Bigelow Aerospace. One final key part of BEAM: It's designed so astronauts should be able to easily pack it up when they're finished.